Six random people that complete at least one of the above goals will win 500,000 credits. 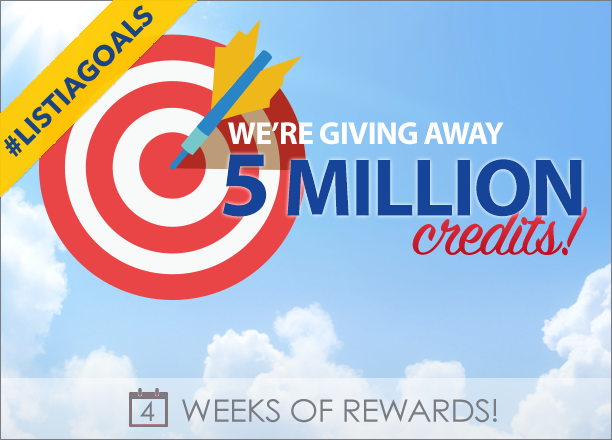 One lucky person that completes all 4 weeks of goals (there are two goal options for week 3) will win 2,000,000 credits! Increase your chances of winning by completing more than one goal! Be sure to check your Listia inbox to see if you’ve won! All 5 goals expire on 10/28/15 at 12:00am PST so that gives you just under a week to increase your chances! Good luck and have fun! (Peace2yaa) I joined back in December 2010. I joined after a friend had posted on Facebook an auction she had won and I have been hooked ever since! Some of the people I’ve won auctions from (and some that have won from me) have become dear friends on Listia and on Facebook. The people on Listia are genuine and they are REAL people. I say this because I have family members who are constantly telling me: “the people you meet online are not “real” people. You just cannot trust anyone you meet online”. Well that is true in for some you might meet, but I have found that the people I have met on Listia ARE real people. They are just like me. They are just like you. Yes, we are all different in some way, but when it comes down to it, we are all the same. Most are kind and will do what they can to help and offer advice. And I appreciate that a tons. Thanks to all the mods who work to make the site a safe and fun place to be! (Rosalynb7594) This site is amazing! Back in 2013, I went through an awful break up that resulted in me having maybe three outfits in good condition. So here I was, in my mother’s house, relying on her charity, but even that wasn’t enough to buy the clothes that I needed. Then I found Listia! In those early two months, I was able to build a basic wardrobe, in addition to buying several jewelry pieces and home items, for less than $30 out of my own pocket! Not only do I get great new-to-me items in amazing condition, but the moderators and users are more helpful and friendly than on a lot of auction sites! (jenniferhulse77) I just really wanted to say thank you to Listia. Since I have been on here, I have met some of the most kindest, sweetest, greatest people I’ve met in a long time. I have found that these people who don’t even know me tell me how sweet and kind I am and praise me for being what I’m supposed to be..I’ve had two woman in particular that have been a heaven sent. One has given me help when she didn’t have to and the other we bonded over an auction she won because it was her father’s favorite. Both of our family members had dealt with cancer and my item was her dad’s favorite. I love making people happy and love that people in this world still care. Thank you for showing me that life is still a good place where strangers will open there lives to you! (donnyhobbs5) I found Listia in 2013 and have been hooked ever since. I didn’t have much money for Christmas one year and a friend had told me about this site where you could take old stuff around the house and sell online to get credits. Best of all it’s FREE to sign up and get FREE credits to start using. At first I didn’t believe him but once I saw it was all true. I then took those free credits and was able to get some really awesome things. I was able to get my family and friends tons of gifts. I thank you and all the Listians out there. I am now on Listia all the time still getting rid of things around the house and trying to tell people about LIstia and willing to teach anyone on how to use this site. Thank you again. (anjelkitty33) I am currently disabled & living off a low income & crocheting is one of the things I am still able to do so I originally came to Listia to get more yarn. Since I’ve been a member I have “met” some wonderful people, won some lovely items, & have been able to auction off my crochet items to people who might not be able to afford them otherwise! I have told everyone I can about your wonderful site, mentioned it on my Facebook crochet page, and talked family members into joining. You site is absolutely wonderful; not to mention lots of fun! I will continue to tell everyone about Listia!! (mrsboone4) For me, since I’ve joined Listia, I’ve met a lot of different people & made lots of new friends. I enjoy sending others items that makes their days brighter & happier. Listia is a great place to find gifts for loved ones or just for yourself. Everyone should experience Listia. It’s a lot of fun.